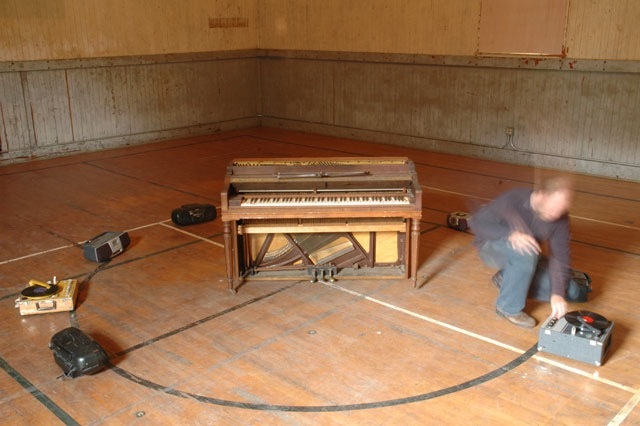 One Word (2005) is a quiet, slowly unfolding ambient sound installation comprised of 12 recordings of piano, heard through speakers placed throughout the room. Beginning with a single note, It gradually grows into unpredictable rhythms and melodies that float across the room from speaker to speaker. It was first performed in July, 2005, while I was an artist-in-residence at the Headlands Center for the Arts in California. Total time: 27:00. During the residency, I made a number of field recordings of environmental and animal sounds. One night, I stayed up until dawn recording the frogs surrounding a pond. The frogs' patterns of emergence and disappearance––from a single sound to a chorus, and then tapering off as the night ended––was loosely transcribed in the piece. The listener is gradually aurally disoriented, with the piece blurring the distinction between live and recorded sound. When I was working on One Word in 2005 at the Headlands Center for the Arts, it was very late at night. It was the only quiet time to record. I couldn’t concentrate very well during the day. Weeks had passed since arriving and it had taken me as long to quiet myself enough to listen to the rhythms and patterns of the Headlands: social, natural, environmental, biological. I mimicked them, transcribed and evoked them, and something different came out of the process. A single note, for one minute. A minute feels like a long time. I hear the piano’s pedal lifting. It creaks in the large room. The note strikes, decays, develops rhythms evoked by the Headlands. A second note joins in. It is anchored to the first. Then a third, a fourth, and I have lost track of time. I feel disoriented, dizzy. The piece grows to thirteen notes, and over the next quarter of an hour returns to one. A week before working on One Word, I stayed up until dawn recording frogs surrounding a pond. I listened to their patterns of emergence and disappearance, from a single croak to a chorus, then tapering off as the night ended. One Word doesn’t sound like frogs, but it does ebb and flow, subtly evoking the aural shape of their all-night singing. The landscape of the place subtly works its way into the structure of the music. Later that summer, I performed One Word at the Headlands Center open house. Recordings were divided among a dozen boom boxes (borrowed from other artists’ studios) and placed throughout a large room. During the open house I performed on a piano along with the recordings. A few minutes before the performance, a large bus pulled up outside. I could see it out of the window. Nearly fifty children tumbled out and filled the room. Perhaps they were on a school trip. I began walking around the space, turning on the boom boxes, playing corresponding notes on the piano, and listening. I found myself in front of an unexpected audience with very different ears from my own. Children aren’t known for being quiet or their concentration. Yet their rapt attention shocked me. What was he going to do next, they were thinking. The piece gradually, subtly, quietly unfolds and then recedes over a half hour. It demands patience. After a while the children understandably became restless. They started to fidget and it was palpable. As I performed I listened intently. I waited for the next shoe-squeak, whisper, stifled cough, twitch, giggle, creaking chair, yawn, sigh. Their actions became a part of the piece. This busload of bubbling children joined the boom boxes, the recordings, and the piano in an overcrowded and darkened room in the middle of an old army base. The piece was borne out of the quietness of the landscape: fog, hills, frogs, ocean. The children in their listening and energy filled the room with something else. They added an intensity that complemented the piece and led to complex and pleasurable listening.